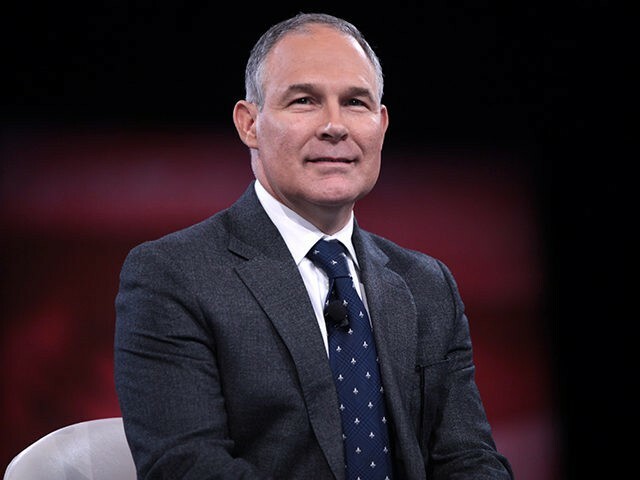 Many, if not all, big environmental organizations have described President-elect Donald Trump’s nomination of Oklahoma Attorney General Scott Pruitt to head the Environmental Protection Agency (EPA) in apocalyptic, disastrous terms. I must, for one of the few times in my professional career, agree with the big environmental organizations. When Pruitt is confirmed as EPA administrator, that will indeed be a disaster—for big environmental organizations. The rest of us, along with planet Earth, will get along just fine. The unalterable trend over the past 40 years, whether a Democrat or Republican is president, is the environment in the United States has become cleaner and will continue to get cleaner. I don’t believe Pruitt wants to alter that trend or will be tasked by the Trump administration to alter that trend, and I don’t think he could possibly encourage or allow environmental damage in 21st-century America. My expertise is air, so I’ll stick to that, but the themes that I’m about to explore will apply to water quality, to wetlands, to hazardous waste management and any other environmental issue you care to mention. Here’s what I believe: In January 2021, when Trump’s first term comes to an end, the air in America will be cleaner, as measured by any reasonable metric, than it was when he took the oath of office in 2017. Air Quality Standards: There will be no relaxation of existing National Ambient Air Quality Standards (NAAQS) for criteria air pollutants, nor will there be any relaxation of emissions limitations that apply to industrial sources that may emit hazardous air pollutants. Air Quality: The nation’s air quality monitoring systems will remain in place and the aggregate number of days that show exceedences of a NAAQS in 2020 will be equal to or less than the aggregate number of days that showed exceedences of a NAAQS in 2016, not counting monitors in the South Coast Air Quality Management District (SCAQMD) in California in either case. That’s it. Those tests sum up the things that matter to most Americans when they think about the air they breathe. They don’t care about permits, records, reporting, public comment, permit appeals, or any of the countless other features of bureaucracy that environmental groups go on and on about these days. Those tools are a means to an end: establishing reasonable air quality standards and protecting air quality. I believe Pruitt will leave unaltered the features of those tools critical to ensuring American has reasonable air quality standards and to protecting air quality. I believe Pruitt will do his best to discard or redesign the features of those tools that have little or no value in accomplishing what is our common goal: a clean, safe, healthy America. A couple of notes before we move on. You may be wondering why I exempted the SCAQMD in my offer of a wager. The SCAQMD encompasses the Los Angeles area, which is basically the metropolitan area that God Created to Make Ozone. Ozone, aka “smog,” is a criteria air pollutant that is primarily generated in urban areas during hot, relatively windless days. LA exists in a geographical bowl that is uniquely prone to hot, relatively windless days. If there are a lot of such days in a given year, then LA will trip the ozone NAAQS a lot. If Los Angeles doesn’t have many days like that, then it won’t. It’s a crapshoot that depends far more on natural variability than any man-made influences. You should also know Big Environment and their allies in the mainstream media will be zeroing in on issues that don’t have anything to do with actual air quality during the next four years. Paperwork violations will become a bigger deal in their world, but I expect a reduction in enforcement actions and penalty amounts associated with that reduction will be their focus. The Environmental NGOs absolutely hate it when industry pays less in penalties to the government. In their mind, or at least according to their PR professionals, that’s clear evidence of pandering to big business. The possibility that a decrease in enforcement might be attributable to an increase of environmental quality never seems to enter their minds. Pruitt’s EPA is a nightmare scenario for Big Environment. Heretofore, every Republican administration has tried to placate environmental NGOs like the Sierra Club, the Natural Resources Defense Council, Greenpeace, etc. Presidents Nixon, Ford, Reagan, and both Bushes all went along, hoping to get along. They allowed the EPA to get bigger, to introduce more and more rules, to make approval processes increasingly complex, and to introduce ever more stringent standards based on evidence that grew increasingly dubious at each retelling of a theoretical body-count that the nation would suffer were not the newest theoretical threat confronted. They did all that and were crucified by Big Environment anyway. To remain relevant, Big Environment needs a threat with which to frighten people and keep those massive donations received coming in. In a nation that gets cleaner and cleaner, that threat must become more and more theoretical. Picking on but one of a gazillion examples I could point to, when President George W. Bush followed through on President Bill Clinton’s initiative to reform a part of the EPA air-permitting system, a proposal that had been far-sighted under Clinton became positively Neanderthal under Bush. If Bush’s EPA got away with that, Big Environment assured us, Americans will be collapsing on the street, dead of lung cancer. OK, maybe they didn’t actually say that, but you get the idea. I have longed for an administration that would have the guts to hold the environmental NGOs to a proper standard of conduct and accountability. Look, I don’t have anything against the Sierra Club. I really don’t. But I do have a big problem with the Sierra Club inventing or exaggerating issues that have little or nothing to do with environmental protection. By all means, let’s make sure that we can enjoy the majesty of Yosemite, that we can do so at a ripe old age, and that there are enough polar bears around to devour enough seals before seal populations get out of control. Let’s do all that and much, much more. But, when it comes to the environment, it should be about pollution, not paperwork. Pruitt gets that. I think a Pruitt EPA will be an EPA that will focus on actual results, not on theoretical threats that might somehow get in the way of achieving those results. When you run a business, you are always searching for the most efficient way to achieve your goal. When you’re in charge of a bureaucracy, the traditional model has been to find a way to achieve your goal that: (a) would make everyone happy, and (b) involved not even the slightest, tiniest, most insignificant bit of risk. I think Pruitt will change that way of thinking, at least as far as the EPA is concerned. He’ll get results. He’ll do so without pandering to Big Environment obstructionism. And, like Trump, I believe he’ll do so by focusing on what matters. Would it be invoking too much irony to suggest Pruitt will be a breath of fresh air? Rich Trzupek (think@heartland.org) is a chemist and environmental consultant who specializes in air quality issue. He is the author of Regulators Gone Wild: How the EPA is Ruining American Industry and has testified before Congress regarding environmental issues.